This is another late post. Went there early August but some how the photos had gone missing till now. This round, Mamarazzi had their Nasi Goreng Kampung. Hmmm....memang delicious. The bilis was crunchy and a lot of vegetable added. Mamarazzi is hooked on their Burung Puyuh Goreng. It's well marinated and perfectly fried. Not too dry nor oily. 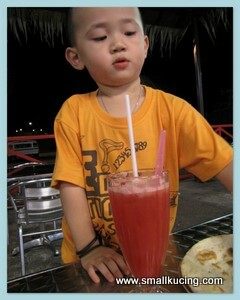 For me, I had watermelon juice and shared Papa's "roti"
This round we saw the Dim Sum stall opened. Tried two of the Dim Sum. Haiya..should have gone there a day earlier coz the price for the Dim Sum gone up and they didn't have the time to up date the price in the Menu yet. Hmm....taste well...kira okay la...maybe Mamarazzi not biasa with halal dim sum. She still preferred those from Chinese Dim Sum shops. Here is the address if you happens to be in this area No 1, Jalan Nova Q U5/Q, Subang Bestari, 40150 Shah Alam. 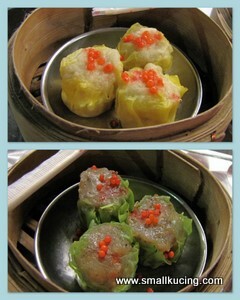 Is the green dim sum a siu mai oso? Aha! I like your papa's roti. What's Kima? Hey, I come to your blog through blog hopping. Have a nice day! still figuring out where is this place. halal dim sum... nice mer? 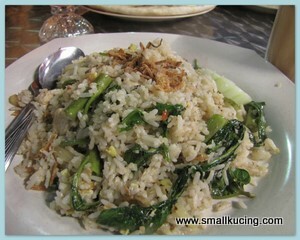 fried rice with so many sayur oh.. 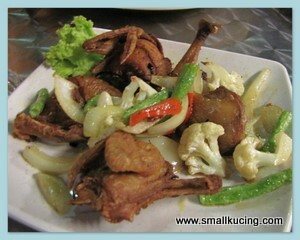 I like the burung puyuh very much, always have this at Indian restaurants, deep fried to perfection. 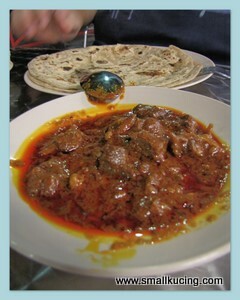 Kima and chapati - how not drool, our kind of food we enjoy so much at home.